HomeCPE: a good reason to avoid surgery in Spain! The retrospective analysis of CPE carriage identified through a routine admission screening programme was performed on a surgical ICU in a 1300 bed hospital. 254 patients had a rectal screen collected over 2 years (2012-2013), and 41 (16.1%) carried CPE. A total of 46 individual CPE isolates were detected (5 patients carried multiple CPEs); K. pneumoniae (85%) and OXA-48 (76%) predominated. Risk factors associated with the carriage of CPE following multivariable analysis were: 3rd / 4th gen cephalosporins in the past 6 months (with a towering odds ratio of 28! ); a beta-lactam or beta-lactamase inhibitor in the past 6 months, abdominal surgery in the past 12 months, and prior digestive / biliary endoscopy. 22 of the 41 patients developed an infection with the same CPE as detected on the rectal screen at the time of ICU admission; the study doesn’t report any outcomes from these studies, unfortunately. The increased risk associated with digestive / biliary endoscopy is a bit of a worry – and makes me wonder about exactly how they are decontaminating their endoscopes, following some high-profile endoscope-associated outbreaks. I was surprised that this hypothesis was not aired in the discussion. This study was performed in 2012/2013 – now almost half a decade ago. I can only image that the prevalence of resistant bacteria have increased during this period, as they have in invasive pneumoniae infections reported to EARS-Net from Spain (see the Figure below). 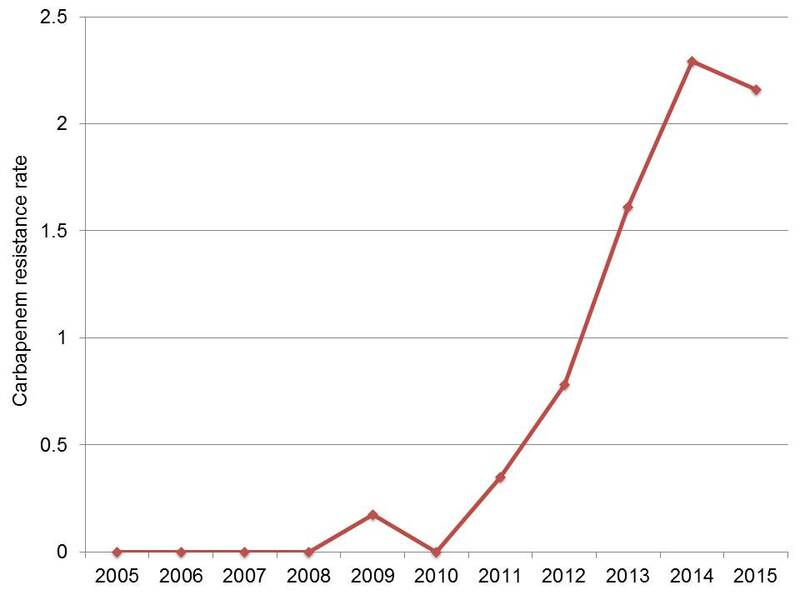 There has been a sharp increase in carbapenem-resistance in K. pneumoniae in the national invasive infection dataset reported to EARS-Net since 2012/13 (from 0.8% in 2012 to >2% in 2015)! ← Let others use your data! Hi Jose, I certainly did not intend to turn the threat of CPE into a joke. This is an international problem, no doubt about it – although it does seem to be the case that some countries are further along the epi curve than others! Having lived through a large, costly outbreak of CPE in London, I have seen the impact that it can cause first hand. So, no, it is no laughing matter. I couldn’t see from the abstract if any of these CPE isolates were genotyped to rule out another risk factor: poor hygiene leading to cross-transmission.